Greetings, Blue! Happy Dog of the Day! Oh my...what a gorgeous, snow white, blue eyed baby you are, Blue! I just can't take my eyes off of your eyes! And need I say, your puppy preciousness is chart topping! From Bassett Hound to Husky? We're talking the yin and yang of doggiedom here! Well, having been mom to a Husky, I know just what fun your humans are in for over the many years to come! Your unbridled energy and Houdini like antics will surely be keeping them on their toes. But it's your unconditional love and devotion that will forever seal your place in their hearts! And how impressive that at a mere 2 1/2 months old you've already mastered an array of commands, are potty trained and sleeping through the night! So much for those "terrible two's!" How blessed your furever family is, Blue, having a furry family member as beautiful, as smart, as special as you in their lives! You're a treasure, Blue, precious beyond words, and so very deserving of your big day of honor! Thanks for the BIG smiles, sweetheart! Meeting you, seeing your heart-melting photos, has been a real treat! Hope you enjoy a very special, fun filled, action packed day of celebration...playing ball and fetching branches, working off some of that unbridled energy, hehe, watching TV and cuddling with your humans, being spoiled EXTRA rotten! Lots of love, cuddles and kisses to you, beautiful Blue, our very special and most deserving Dog of the Day, EVERY day! What a handsome boy you are, and so smart. imagine what you will do over the years. 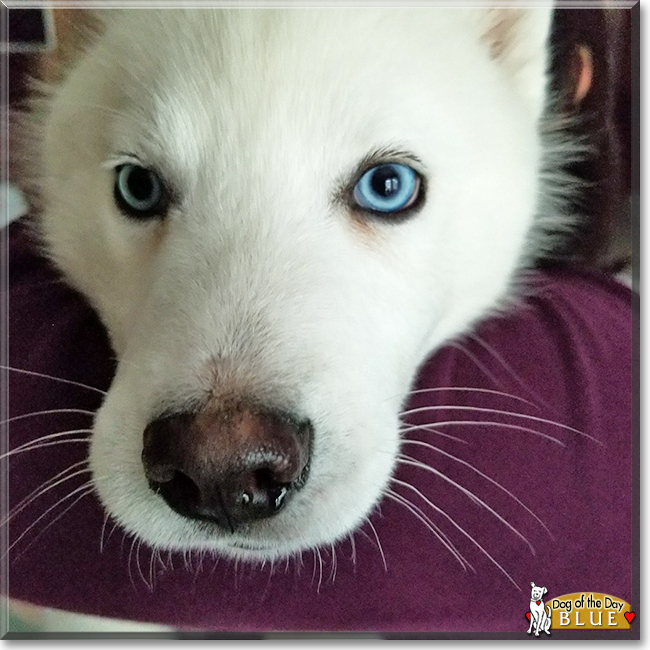 What a beautiful blue eyed Husky you are, Blue! Congratulations on being Dog of the Day! Blue is a heartbreaker alright, what a beauty! I hope you realize what you are in for, but you will surely find out pretty soon. I have faith that you will be perfect husky parents! What a smart and beautiful DOTD! Such a pretty boy ❤️ I'm in love.